Easy and amazing key lime magic cake recipe, watch as this cake develops magical layers. 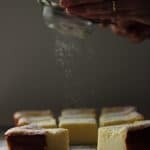 I thought about making this Key Lime Pie Magic Cake recipe post in the style of Wordless Wednesday. For the past few days I’ve been completely stuffed, sneezing like crazy and if I rub my eyes any more, I swear they might pop out! It’s late and I want to go to bed. But I wanted to explain a little about my latest magic cake. I just found out one of our neighbors in the street has a key lime tree. So far that makes our street an abundance of lemons, key limes, figs, oranges, peaches, grapes kumquats and plums. We could seriously start our own farmers market. She was kind enough to give me some key limes and of course the first thing I thought to make was key lime pie, right? But I haven’t made magic cake in a while and my mantra is, you can make anything into a magic cake. This is my fifth version of the layered cake which usually looks like it’s a positive fail when it goes in the oven but comes out with a cakey top and soft custard bottom layer. 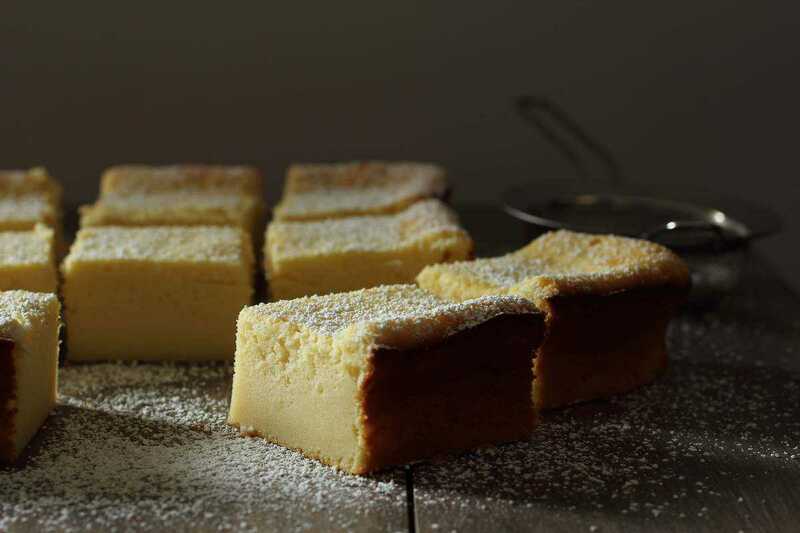 I made a few adjustments to this original magic cake recipe from White On Rice Couple. I always follow a rule of mine whenever I begin to change a recipe, trying not to add more ingredients but adjust or switch out the ingredients already listed. Changing a liquid to another liquid or switching up seasonings. This way there’s less chance of the structure of the recipe failing. I tried to get as much key lime pie flavor into this recipe as I could, so for me that meant adding sweetened condensed milk and the key lime juice. I was happy with the cake but be warned magic cakes aren’t particular sweet or gooey like brownies or blondies, but I love the texture and I could definitely taste the tartness of the key limes. Preheat the oven to 325 degrees F. Grease an 8 x 8 brownie pan with butter. In a small pot, combine the milk, condensed milk and granulated sugar until lukewarm. Using a stand mixer, whip the egg whites and vinegar until stiff peaks form. In a larger bowl, whisk the egg yolks and the confectioners sugar together until it turns a pale yellow color, about 3 minutes. Add the melted butter and mix. Next add the lime juice and combine. Add the milk mixture gradually whisking well each time. Add the flour and mix well making sure there are no lumps. Finally fold in the beaten egg whites in 3 stages making sure to get rid of most of the lumps but still try to keep it on the lighter side. Once all of the egg whites have been mixed in, pour the batter into the prepared pan.until about an inch from the top. Place in the upper part of the oven and bake for 50-55 minutes. The top should be still slightly wobbly when done but you'll see small cracks appear around the edges of the cake. It will continue to firm up as it cools down. Dust heavily with extra powdered sugar before slicing and serving. The cake is best served at room temperature and will slice better when completely cool. Store in the fridge if you're not going to use it for some time. This cake looks AMAZING! Love, love, LOVE! 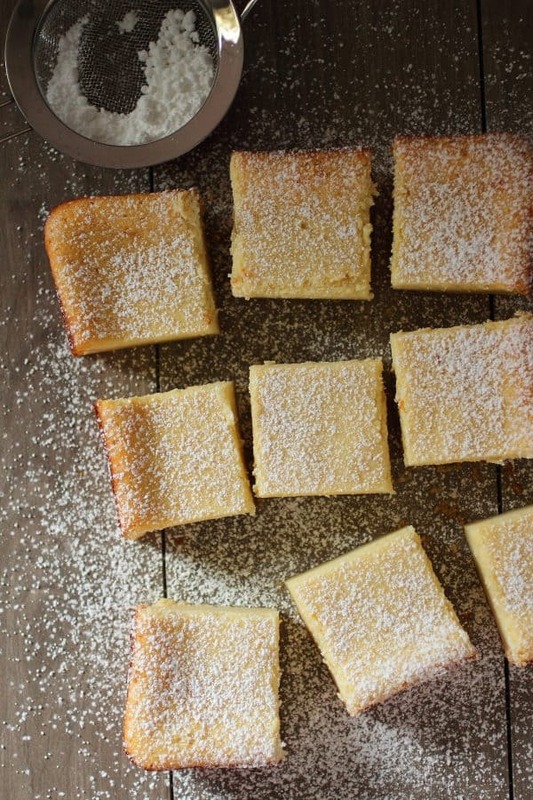 I love a citrusy cake to kick off springtime! This one sounds incredible, Gerry. Love your photos, too! wow! you had me at magic cake… with key limes? amazing. great photos too! 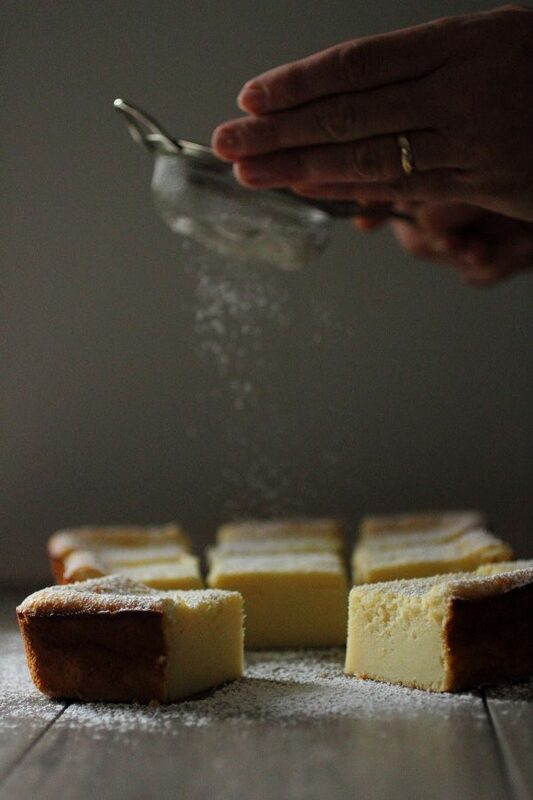 These remind me of cheesecake…gorgeous clicks, Gerry. I love key lime. This recipe looks delicious and so full of flavor. Thanks for sharing! Love how you worked key lime into magic cake. It looks so elegant! I would love to have all those fruit trees around me. Fruit is my favorite thing to eat and bake with. 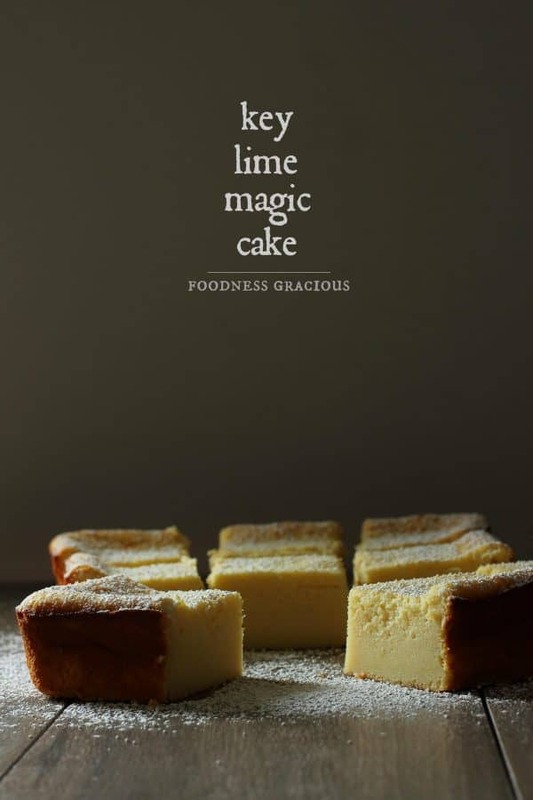 Ok, you’ve convinced me that I must try magic cake – your lime version looks incredible! So when does the milk and sugar mixture get mixed in? Am I missing that step? You heat it up and then what? Milk and sugar get added after the butter gets added to the beaten egg yolks. Hope this helps and ill check out the print for any errors. Thanks..
Love this new version of the magic cake! Fabulous photos, Gerry!! Pinned! I love key lime. This looks delicious! you have definitely inspired us to try and make magic cake and arkadi loves lemony/limey desserts! 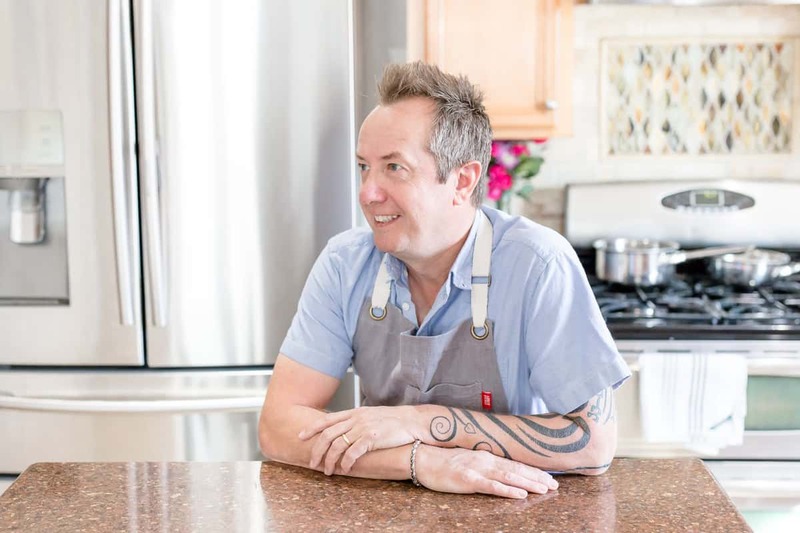 And just like that you’ve given me the dessert for my hubby on Father’s Day…. Have these in the over right now for a Father’s Day dessert. Just a head’s up this recipe is bigger than an 8×8 pan. I poured into an 8×8 and saw it wasn’t going to fit and had to grab an 8 inch cake pan because I didn’t have another 8×8. Looking forward to tasting in a hour! Just made this for my key lime lovin husband for his Father’s Day dessert! Cannot wait to make this for my husbands birthday! This cake is gorgeous!! I still need to make this!! This magic cake was so good, thanx for the recipe. I will be making it again. How would these shi, it takes 2-3days to get to my Airman. Hi, I’m not sure they’d ship very well that long out of the refrigerator. So I made the cake. It is a very dense cake because the wet to dry ratio is significantly larger. So if you’re into really dense cake that taste a little on the raw side, then this might be good to try. Flavor is ok too. I added lime zest.